Researchers at the University of Michigan developed a graphene oxide-based device that could provide a non-invasive way to monitor the progress of an advanced cancer treatment. The device is able to capture cancer cells out of a blood sample and let them go later, enabling further tests that can show whether the therapy is successfully eliminating the most dangerous cancer cells. The scientists explain that cells released into the bloodstream by tumors could be used to monitor cancer treatment, but they are very difficult to capture, accounting for roughly one in a billion cells. In their quest to develop technologies for capturing such cells from blood samples, they researchers designed devices that trapped the cells on chips made with graphene oxide, but all analysis had to be done on the chip because the cells were firmly adhered. However, it was found important to study cells individually, and this new device makes this possible. The main challenge was releasing the cells without damaging them, so the team worked on design principles for creating chain-like molecules with particular capabilities, and developed a polymer that is solid at room temperature but falls apart at a temperature that can be set anywhere between about 40 and 68 degrees Fahrenheit. The polymer dissolves in water when it interacts with water molecules. At higher temperatures, heat breaks up the interactions, so the polymer doesn't dissolve. The team set the polymer to dissolve at temperatures below 54 degrees, them mixed the tiny cell-catching graphene oxide flakes into the polymer and built the chip into a device to guide the blood sample over it. The result is said to be very gentle for the cells, contrasting the slight dip in temperature with other designs that rely on heating or enzyme-induced chemical reactions to release the cells. 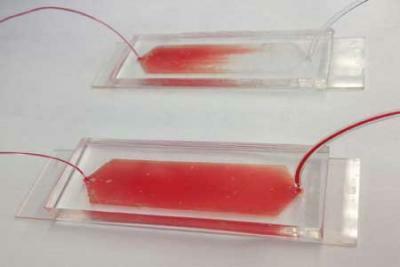 The device can capture and live-release up to 80% of the cancer cells in the initial blood sample. Then, the clinicians could collect the cells into a tissue-like sample for conventional analysis, which can reveal the proportion of captured cancer cells that are stem cells. Alternatively, they could identify single cells for more detailed study, such as full genetic sequencing or tests that identify which drugs would be most effective.